UNR is designed so that every application you run is automatically maximised to fill the scree, with the icon of the application docked in the top-left corner, giving you a tabbed interface for accessing your running applications. This works nicely, although you do notice a slight delay when each application opens up for the first time. Attempting to open more than one instance of an application simply returns you to the first instance. If you don't get on with UNR, you're but three mouse clicks away from reverting to the traditional Ubuntu desktop based on the proven Gnome environment. Jaunty itself has bought with it some huge speed improvements that mean boot times of around 20 seconds, excluding the initial start-up test. Taking the graphical performance into account, this is certainly a choice distribution for getting work done. Until the release of Jaunty, Eeebuntu was one of the best ways to get Ubuntu Netbook Remix onto your netbook. Version 2.0 was based on the previous release of Ubuntu, Intrepid, but Eeebuntu 3.0 is now available and it's based on Jaunty. EeeBuntu isn't simply a rehash, though. 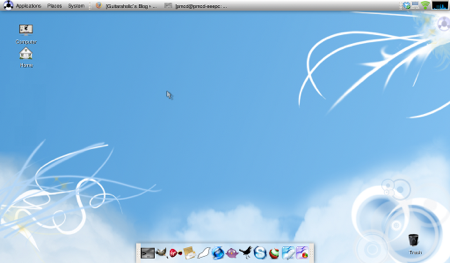 The developers have gone for a variant on the standard Ubuntu UI for the mainstread Eeebuntu Standard release, but Eeebuntu NBR delivers the Netbook Remix UI. You can download either of these separately - or Eeebuntu Base, which is a pared back version that installs a bare minimum of software, leaving you to put in place only the apps you want. All three versions of Eeebuntu comes with an Eee PC-specific kernel rather than Ubuntu's generic one, so it's tuned from the start for the Eee's hardware, from the Wi-Fi module to the function keys. 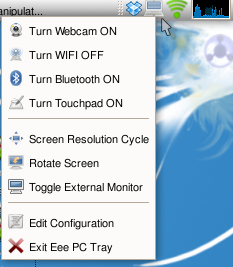 It also comes with EeeConfigure scripts also set you up with everything you need depending on what model of Eee you have, and there's EeePCTray, a menu item that provides direct access to Eee-specific features. We also see other nice additions such as VLC installed out of the box, as well as Flash and Java. If you have an Eee PC, this is certainly the version of Ubuntu to go for.